Vacation rental house. Sleeps 4, 2 bedrooms, 1.75 bathrooms. Dogs allowed. Look at that view! It's even better when you're watching it with a cup of coffee or a glass of wine in your hand! You can see the ocean, the beach, the estuary and Shamel Park! There are awesome ocean views outside the living room. This side yard opens to the front door and extends to the rear and is fenced for your pet. More of the fenced back yard area for your pet and your enjoyment. My wife our Havanese ( Wilson ) and I stayed at that view for 30 days mid Feb - mid March of 2019. We spent nearly every afternoon on the sun porch sipping a glass of wine and enjoying the view of the ocean. The barbecue was nice and a nice area to do your grilling. We didn’t use the downstairs bedroom but the upstairs one was very comfortable. The kitchen was upgraded nicely although it could use some new pots and fry pans. The kitchen could also use a salad spinner and a vegetable steamer. We loved the home location because of proximity to Main Street and the weekly farmers market. We would rent the home again. This is at least the third time we've rented this property. Obviously we love the place and the view is to die for. I wish we could have stayed longer. I also wish you were still offering the 2 day credit for longer stays. That would encourage us to rent That View for longer stays. This is the 4th year I have stayed at this house. It's like home away from home. Its cozy, the view is spectacular and it's just a 3 minute walk into town. Wish I could live there! My dogs love it too! On arrival, it is easy to be rather overwhelmed by the owner's very individual style (and there is a lot of it). However this a a good sized property in a very good location near the beach and shops of West Cambria. There is evdence that the owner has a pet and a suggestion of air freshener covering some other odours on arrival but opening windows definitely helps. Some furnishings and decor are rather weary, the outside space rather cluttered with some cobwebs in the unusual side porch. However bathrooms and kitchen were clean snd tidy and beds comfortable, its just more like an air bnb rather than a bland holiday rental. We would stay there again. Hard to beat the location, walk to Shamel Park and Fiscalini Ranch. 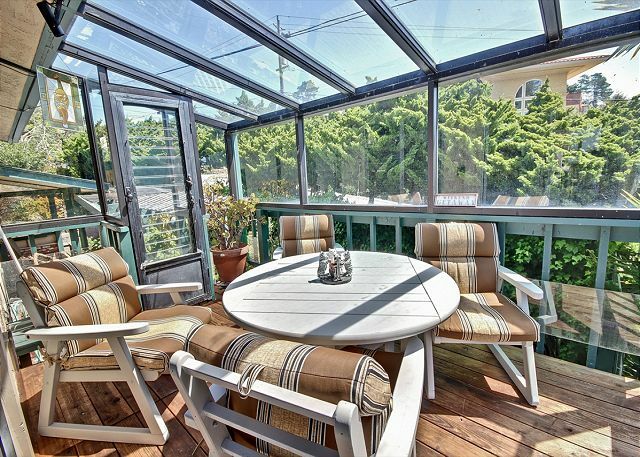 Sunroom is probably the best selling point. Plus owner's last name is town I grew up in! This is a great little escape! You truly can walk into town, or to Moonstone Beach. The house has tons of charm and it's very easy to relax into the view. We enjoyed our stay very much. The only improvement perhaps could be some better linens and towels, but the house is a great value and I would recommend it. We enjoyed this lovely home, clean and comfortable and well appointed, also close to all points of interest in Cambria. Walk to Moonstone Beach and West Village. We thoroughly enjoyed our stay in That View. We spent 5 nights Oct. 2017 in this lovely home. The home is set up to take advantage of the wonderful view. The sun room is perfect to take it all in. Location is very good. We could walk our Golden’s to town or Moonstone. House is very updated since photos with lovely granite, new cabinets, furniture and remodeled baths. The chaise in front of the window was my favorite spot in the home. Owner did lovely Fall decorations which was an added touch. The home was very clean and had all the amenities one needs. I have stayed in many Cambria rental homes but this one is my favorite and hope to stay here again on my next Cambria trip. We left the Napa area to escape the fires and breathe a little clean air, and Cambria did not disappoint! The town was beautiful, and our rental was absolutely fabulous. It was inviting, comfortable, and spacious. I don't think our toddler and pup wanted to go home, they enjoyed themselves so much in the home. The kitchen had everything we needed to cook meals, and we were able to eat on their beautiful patio and enjoy the sunset and ocean view. The home is even equipped with cable and netflix for viewing pleasure. We will be sure to stay here if we visit the area again! Great view of ocean. House was nice! PEACEFUL and the dogs loved it. Great views of the ocean, no noise at all. Couldn't have been nicer. The house met our needs perfectly! Close to town yet still close to the beach. It was quiet and very relaxing for our family get-together. 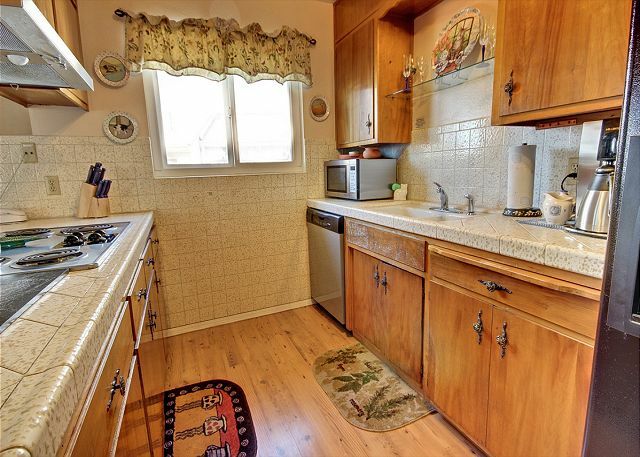 The kitchen has been beautifully updated since the photos on the rental site. I've rented other properties in Cambria before through other companies, but the Breen experience was the best. The website was most helpful in selecting our rental and the property was as advertised. Terrible traffic jam on the way there(head on collision on Hwy.46. Couldn't drive fast enough for other drivers on 46 from 101 to Hwy.1. Got turned away from Linn's twice and West End Pub & Grill once. Other than these issues, we had a great time with our dogs. The house had a cat smell to it that was initially covered up by disinfectant. Great view and location. Wish we were still there, it's 109 degrees today in Bakersfield. You provide great services at reasonable prices. Thanks very much! wonder, relaxing,peaceful.the rental was very clean!look forward to our next trip and renting again. Nice roomy house, great views. Kitchen fully stocked with all you need to cook a meal. Can walk to beach and town. The step down to the downstairs bedroom and bathroom is a hazard. 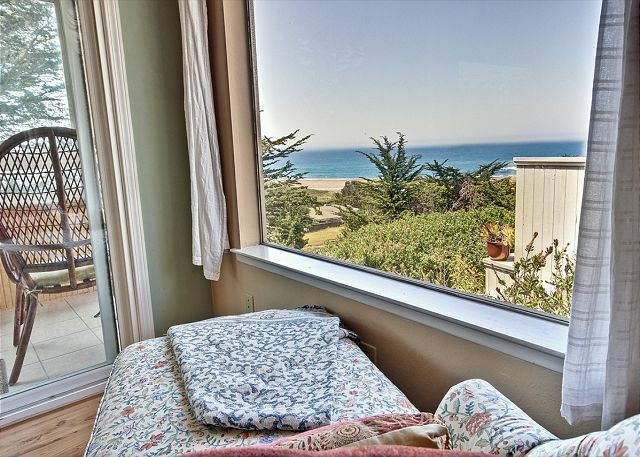 Peaceful, much-needed rest guaranteed in this lovely, quiet home with its spectacular view over the ocean and Moonstone Beach. Great! We love coming to Cambria. We have been coming to Cambria since 2005 and have been using Breen Vacation Station since 2006. Great view at a reasonable price. Ideal for a relaxed getaway. This was a great place to spend a relaxing, romantic weekend. The staff was very friendly and helpful. The house was very clean and had all the amenities one could ask for. Offered a great view!! The only thing is - if you use the BBQ grill, the sitting area above it gets covered with smoke. If only the grill was placed at the back, it would have been awesome! But overall, had an amazing experience. Can't wait to visit again! The pictures do no justice this this Rental. It was amazing! We brought our dogs with us and they enjoyed the freedom to room the yard. The kitchen was very nice and the bed was ooh soo comfortable! Im going back there again next year! The property is dated, the plants outside are on a drip system which is fine, but because of the water shortage the water features are not being kept up. There was algae and it SMELLED bad. Also the main bathroom door was badly scratched up. This was the nicest vacation home we have stayed in. The view of Moonstone Beach is better than the pictures. Cambra is a delightful small town and the food is wonderful. We stayed 10 days and that was way too short. a guest from Lake Almanor, CA does not recommend this vacation rental. Enjoyed our stay in your area. Great view and the town and beaches were super. House should have some comfortable chairs and mattress. Also a clear cupboard for guest's food, etc. Also needed hangers. Pluses: homey; quirky layout; great view; dog-friendly; great view; fun decor (cats!!). Minuses: problem with no electricity in master bedroon, and had to call maintenance contact for the property, and he was delayed because he was out of town. Also, TV-audi/visual cables were all messed up (maybe from the previous renter? ), and took us almost an hour to get things right so we could play a DVD. Suggest the house-cleaner between renters check it all out to make sure its okay. Maybe the last guest plugged in an XBox or some such thing, and didn't reconect cables correctly. The view is tremendous. Lots of places to sit. I would like less knick knacks to move out of the way and more useable dishes and mugs instead of cast offs. Upstairs is lovely but there is a musty odor downstairs that may smell like cat urine, sorry. Great place and location would like to give a great rating. Hope to come back! Cheryl N from Panorama City, CA does not recommend this vacation rental. Initially, we were very disappointed with the exterior landscaping...abundant weeds, murky ponds, old chairs which should have been trashed. And the bed was hard and very uncomfortable. New comfortable pillows are necessary. The kitchen lacked any spices or condiments which were always available at other home rentals we were at. We enjoyed the enclosed patio and its attached deck very much. The location was perfect & the view was nice, but would not stay here again. Wonderful clean and cozy place with an amazing view and walking distance to everything (it seemed). We would definitely stay here again. The only thing the owners need to look into to make it perfect is changing out the mattress in the downstairs bedroom. Our friends drew the short straw and had to sleep there. They said thumbs down on comfort. So, if you are only two, no worries, you can sleep on the good bed in the nice bedroom. Other than that, the place is Great. OH, and did I say, That View!!! Everything was pretty nice except the bed upstairs is really uncomfortable, lumpy, crooked and/or broken. One side sloping down so you feel like you're constantly rolling off the bed. Totally unacceptable, backache all week. The BBQ is rusted and broken, unable to use. We love to BBQ and had it all planned, purchased food based upon grilling and then were unable to. Dissapointing. The rest of the house was very nice although they could use some cooking utensils and a better variety of pots and pans. King size mattress needs to be replaced. Too many nick-knick knacks on counter tops and table. Great location...Even better view! Charming house in a great spot just on the edge of town...Close to everything with a stunning view! Awesome Location for Convenience and a Terrific View! My reservations were handled with ease and politeness. It was a very convenient check-in and the house was super easy to find on Happy Hill. The views from the inside of the house and on all the decks were awesome ocean views. There is a nice little two seater bar table on the main enclosed sun deck that is a perfect place to watch the waves and enjoy a glass of wine which Breen Vacation Station was kind enough to supply. 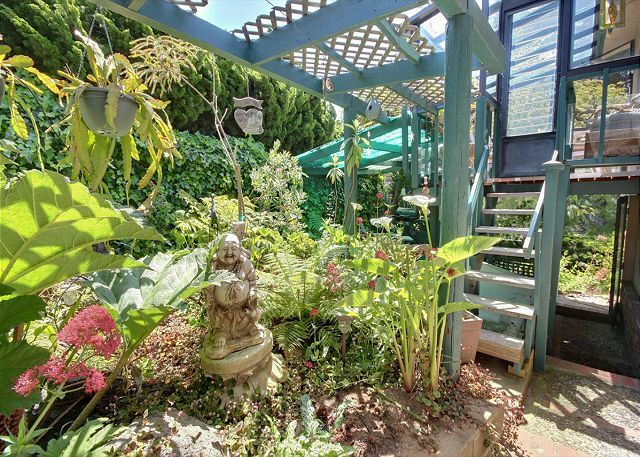 The fenced-in yard was small but very private and planted with lush and interesting flowering plants and frog ponds. The deck overlooking this part of the yard has a very nice table with four comfortable chairs. Moonstone Beach is a 10 minute walk as is the west end of town. If you bring fido, there is a dog friendly beach just 4 miles north at San Simeon which you can enjoy without running into more than a small handful of people on the weekdays. The only draw back was the noise from the street traffic as the house is on the corner of a well traveled street. Also, the neighbor is a very early riser (4 a.m.) and turns on an outdoor light that shines into the master bedroom. Bring your sleeping mask and maybe your own pillow. All-in-all, it is a wonderful vacation house for the price. I would stay here again. we always enjoy our stay. Our friends said that the bed in the lower level is very uncomfortable. Otherwise everything was great! Good visit but dirty dishes! Over all pretty good. A beautiful view as advertised and great location. A very big negative was that the dishwasher was broken and apparently someone didn't notice this before we arrived and the dishes in the cabinets were dirty. We also had to wash dishes by hand before and after we used them. Not what you would expect with this level of a rental through Breen Vacations. Nontheless, we enjoyed the view and our stay most definitely. With a few tweaks this place could be perfect. TVs, satellite and wireless internet were great! The views were astonishing. The location was very convenient. The kitchen was well equipped. Lots of closet space. Great shower. One car garage with opener was nice. Small, fenced backyard was great for a small dog. The bed in the master was very comfortable. The furniture in the living room was semi-comfortable, but a bit dated. The kitchen cabinets were not in very good shape and could use an upgrade. It was quite clean, but the windows were filthy and that really had an impact on the view. Only three of the windows had blinds and they were very dirty. The bed pillows were awful. I would recommend bringing your own if possible. Breen was a very good agency to work with. Everything with them was efficient and smooth. Fabulous. All I could hope for and more! We loved our time in Cambria. We were able to bring our dog with us and the property really felt like a home away from home. We were walking distance from town and had a lovely view of the ocean from our windows. We look forward to returning soon!! Stunning panorama, great comfortable house with a great floor-plan, well-equipped kitchen, great audio-visual equipment. We fell in love with the house! We would buy it in a minute. I think we found our new favorite rental. Property management Breen Vacation Station were very professional! The rental was a little outdated but clean and comfortable. Very good view. We were comfortable, just a little too many home decorations so came across a little bit cluttery. Felt like I was staying at my grandma's house. I loved it here! It was not right on the beach, but just relaxing in the sunroom with the windows open...we felt like we were closer than we were. The house is very tastefully decorated and It had everything we needed, located on a quiet culdesac. Can't wait to stay there again. The view is spectactular and loved the enclosed porch to sit and look at it. Didn't like the intial greeting if a green slimmy pond--can you say West Nile Virus. Would suggest cleaning it out and putting in ocean glass so doesn't have to be maintained. Worse thing about this house though was NO WIFI. Terribly inconvient to have to go to village to do any business. Overall it was a cute house but not very modern. Has lot of steps and bizzar broken up sitting areas. Also has a musty odor could use a dehumidifier to help with this. Great location, close to downtown and the highway (but no highway noise), two minutes from the water. Clean, ample seating, quiet. Would rent it again and recommend it. It was a wonderful place to stay for a romantic weekend getaway! Thanks A bunch My parents had a great time and reaaly enjoyed their second Honeymoon. After 50 years they deserved it and your company made it outstanding. Thanks again for all that you guys did. House is cute, convenient especially for a pet, private and view is terrific! However, home needs general overall maintenance and deep cleaning: shampooing of carpets, cleaning under sofa cushions, curtains laundered, etc. Hand towels and tea kettle need to be replaced. No key suppled for door into house from garage. Overall, house is a great place to stay--with a little more upkeep, it would truly be a pleasurable experience. Christin C from Santa Barbara, Ca does not recommend this vacation rental. The house was lovely, the view terrific, BUT!!! Not only was there no internet, which I kind of expected, but also no cell phone service or even an answering machine on the landline for messages from guests. "Are you in darkest Africa?" a friend asked when I finally found cell service at the top of the hill on the Fiscalini Ranch trail. That's what it felt like at times--too often. The situation should be spelled out more clearly in the rental information and surely an answering machine isn't too much to ask! Our stay was great. 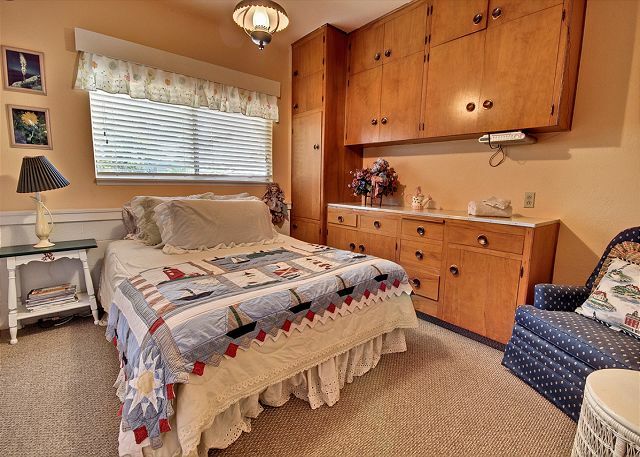 The property was very clean and cozy and walking distance to everything. It is only a few steps down the hill to downtown Cambria and just cross PCH and you are at Moonstone Beach. We even ended up walking to the Fiscalini Ranch trails. I was initially worried that there would be noise from PCH, but you cannot hear or see it while in the house, even with all windows open. Instead there is a beautiful view of the south end of Moonstone Beach. I highly recommend staying here. The view is worth it, but there are some drawbacks. The downstairs (basement) bedroom has a very musty odor (fortunately we didn't need it). The upstairs king bed is VERY hard. We were not told that there would be a $35 charge for paying by credit card. Our stay was wonderful, in most respects. Beautiful view, quiet neighbors, easy access to town, etc. The beds were disappointing, however. The master bedroom bed was worn into two grooves; the downstairs bedroom, itself, was not very inviting. Also, the house is quite moldy -- especially the master bath tub area. I mention the above only because I would not rent that house again if the bed was still in place. This could be helpful information to you. And....we did have a wonderful stay in "That View" and became attached to the house over the course of ten days. Thank you!! My husband and I enjoyed staying at this property with our dogs! It's very close to town and Moonstone Beach, and it has the best view! We had a great time and loved it. We enjoyed ourselves so much we recomended it to our sons company and their going to stay. Really enjoyed our stay the only complaint is that the home needed more ventilation a screen door would of helped alot. Also, I would suggest that they supplied internet service. Other than that it was perfect. Madeline's restaurant and wine store. It was fabulous and we were able to have our small dog out on the patio looking to town. The only problem was with the TV in the bedroom. We couldn't get it to work. What a great home! It was a wonderful and relaxing vacation! The only way to improve our experience would have been to move the house to the beach! Not really a short walk to the beach, but still a very nice home to rent. View is fantastic! wonderful unit. To be nit-picky, the only the we did not like was that there was no screens on most windows. We would have liked to have more fresh air come through the house. But, the view more than made up for any as inconsequential as that! I love the location and views at this house. My only suggestion would be an "uplift" in decor. Nothing major is needed, maybe even a "less is more" approach. Kitchen could use a bit more utensils/tools. I have stayed here twice, referred it to others and will probably stay again just because of the location, pet friendly and view. Thanks to Bob and his entire staff for always providing great service! We loved "That View".. the house was fantastic. Beds were comfortable, things in the house were relatively new and in good shape. Checking-in was very nice- friendly people and we received a great bottle of wine! Breen Realty Rental in Cambria was great. The location was great and the house was just what I was hoping for. A great view and very convenient location. The rental process was easy and the property manager was very helpful and available. I highly recommend it. Great place to relax with the Family! Everything was perfect, except that the house cleaners were there an extra 1/2 hour so we had to wait 1/2 hour after our given check in time; the housekeeper was friendly though. Other than that, the place was excellent, and we will definitely refer friends to your company!